SERVICE: Short Evening Prayer Service (Maariv) at 7:30 pm. 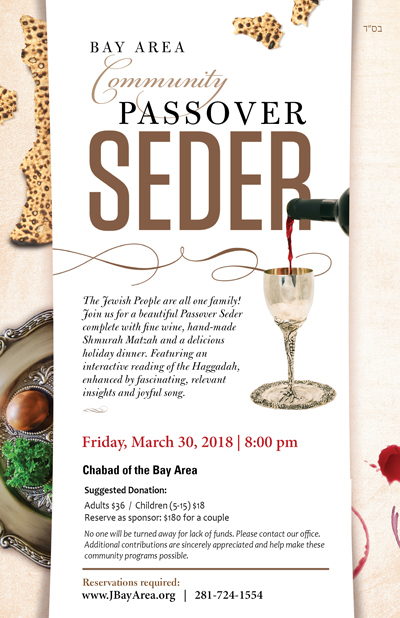 At Chabad Bay Area, 2047 W. Main St, Suite B7. Join us for this special Shabbat Passover service! 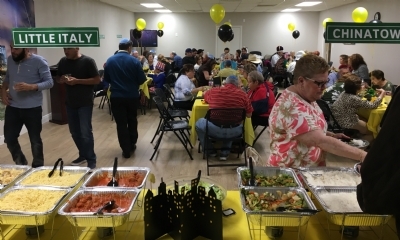 Partner with us in our efforts to bring Jewish holiday awareness to our fellow Jews with community Passover Seders, Shmurah Matzah distribution and providing guidance and assistance with the practical aspects of Passover observance. Online: Make a contribution at www.JBayArea.org/Give and mention "Passover Fund" in the Honor box. Mail: Chabad of the Bay Area, 2047 W. Main St, Suite B7, League City, TX 77573. 60 seconds for a more meaningful Passover. Because we can't always get rid of all Chametz (leavened products), there is a simple solution which involves selling our Chametz to someone who isn't Jewish for the duration of Passover. Click here to sell your Chametz online. It takes just a minute and is free. Must be in by Thursday, March 29. Join us for a beautiful Community Passover Seder complete with fine wine, hand-made Shmurah Matzah and a delicious holiday dinner. Featuring an interactive reading of the Haggadah, enhanced by fascinating, relevant insights and joyful song. (An option to join for the 2nd Seder is also available - please contact our office for more info). If you have ordered Shmurah Matzah, it is available for pickup. Please contact the rabbi before coming over. If you haven't ordered yet, we still have some available. Join us for a Pre-Passover Class! (note, this will actually be one class, not two as earlier posted). Add meaning and inspiration to your Passover Seder as you come well-prepared with fresh insights into the story, customs and rituals of the holiday. Followed by a Q&A on some of the practical aspects of the holiday. 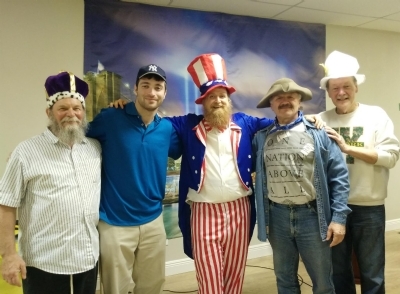 Photos of the Week - "Purim in New York!"